Greenland White-fronted Geese breed in the coastal fringe of west Greenland and winter exclusively in Ireland and Britain. The largest numbers are found in County Wexford, Republic of Ireland, and on Islay, Scotland. The rest of the population is mainly concentrated at regular wintering haunts across western Scotland and northwestern and western Ireland. Greenland White-fronted Geese are declining and the highest conservation concern among the UK’s geese. An AEWA Action Plan has been prepared to focus and prioritise conservation actions. Annual estimates of the population size of Greenland White-fronted Goose in Britain and Ireland, spring 2003-2018 (Fox et al. 2018). Annual estimates of the proportion of young (%) and mean brood size (young per successful pair) of Greenland White-fronted Goose in Britain and Ireland, 2002/03 – 2017/18 (Fox et al. 2018). Greenland White-fronted Geese breed in the coastal fringe of west Greenland. They migrate south through south and west Iceland during September and October to winter exclusively in Ireland and Britain (Fox et al. 1994). Throughout its wintering range it is associated with a landscape characterised by peatlands and low intensity agricultural land. Wintering areas are often remote and flocks can be small and difficult to locate. The present winter range has not changed markedly over recent decades. It is distinctive in being concentrated in the northern and western fringes of Britain and Ireland (Fox et al. 1994). Two thirds of the Scottish population occur on Islay, the remaining located at 33 regularly used sites, mostly in western Scotland, with Tiree, Coll, Rhunahaorine and Machrihanish supporting the largest numbers. 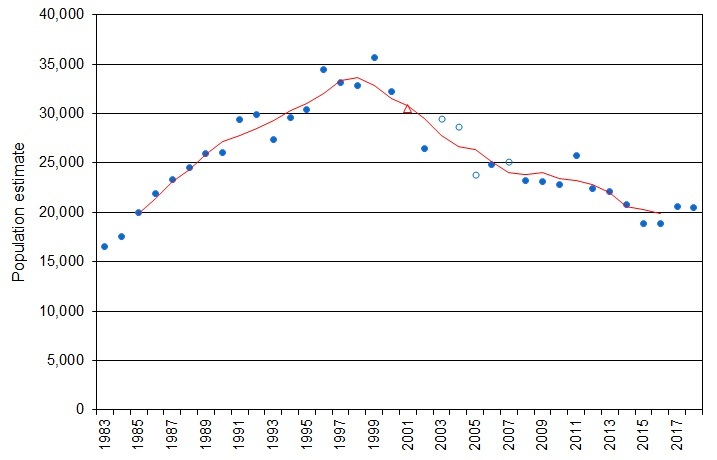 Throughout the period of expansion (principally the late 1980s and 1990s), numbers in Ireland underwent slower growth than the rest of the range. The underlying trend has been a gradual contraction of range, and reduction in flock size, with at least five extinctions known to have occurred since the early 1980s. Two thirds of the Irish population occur at Wexford Slobs, the remainder winter in smaller flocks over approximately 30 sites throughout the west and north of Ireland. Thirteen of these sites have shown decreases in numbers and trends are strongly related to range size, particularly the number and size of feeding sites (Fox et al. 1999). Traditional feeding occurred on bogland habitats but in recent years geese have increasingly used intensively managed grassland, especially in the most important wintering areas of Wexford and Islay. Some waste root crops and spilt grain from stubble fields are also taken in autumn. Several flocks have retained bogland roost sites where traditional feeding may still occur at night. Goose management schemes were initiated in 1992/93 by SNH to alleviate the conflict that had arisen due to damage to agricultural crops through goose grazing (Fox et al. 1999). Since the peak in the late 1990s, the Greenland Whitefront population has gradually declined. Reproductive success has been consistently poor meaning the percentage of young produced each year is too low to replace annual losses. Though reasons for this are speculative, it is thought competition with Canada Geese at breeding sites in Greenland and increasingly late arrivals of spring weather are contributing factors. In response to the change in status, the Icelandic Government announced a ban on hunting of White-fronted Geese in Iceland in autumn 2006. Up until that point, shooting mortality accounted for some 3,500 geese per year. Fox, A.D., D.W. Norriss, D.A. Stroud & H.J. Wilson. 1994. 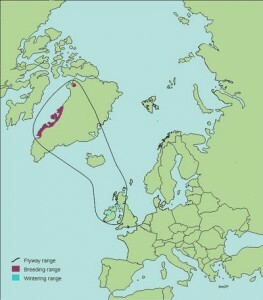 Greenland White-fronted Geese in Ireland and Britain 1982/83 – 1993/94. Greenland White-fronted Goose Study Research Report No. 8. Fox, A.D., D.W. Norriss, H.J. Wilson, O.J. Merne, D.A. Stroud, A. Sigfusson & C. Glahder. 1999. Greenland White-fronted Goose Anser albifrons flavirostris. In: Madsen, J., G. Cracknell & A.D. Fox (eds.). 1999. Goose populations of the Western Palearctic. A review of status and distribution. Wetlands International Publication no. 48, Wetlands International, Wageningen, The Netherlands/National Environmental Research Institute, Ronde, Denmark. Counts of Greenland White-fronted Geese are carried out through the Greenland White-fronted Goose Census, which is organised by the Greenland White-fronted Goose Study. The counts are conducted across the wintering range and involve two counts; one in autumn and one in spring. The census also involves making age assessments of the flocks, during which counters record the number of young present as well as brood sizes (i.e. the size of family groups). These assessments provide information about the breeding success of the population. Results from the censuses are presented in various reports which can be downloaded from the Reports & newsletter page or from GWFG – Conservation. 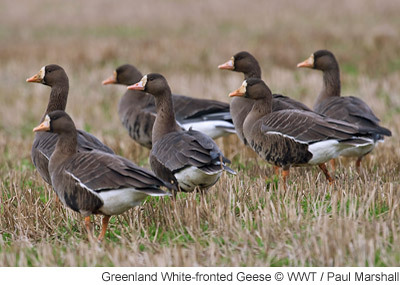 Find out more about the Greenland White-fronted Goose Census. Coordinated counts of the Greenland White-fronted Goose population in Britain and Ireland were carried out in autumn 2017 and spring 2018, representing the 36th annual census. The counts were organised by the Greenland White-fronted Goose Study in Britain and by the National Parks & Wildlife Service in Republic of Ireland and Northern Ireland. Combining the results from the spring 2018 coordinated counts in Britain and Ireland gives a population estimate of 20,529, a slight decrease of 0.1% compared with spring 2017 (Figure 1). Figure 1. Annual population estimates of Greenland White-fronted Geese, spring 1983–2018 (filled circles) (from Fox et al. 2018). The five-year running mean (e.g. 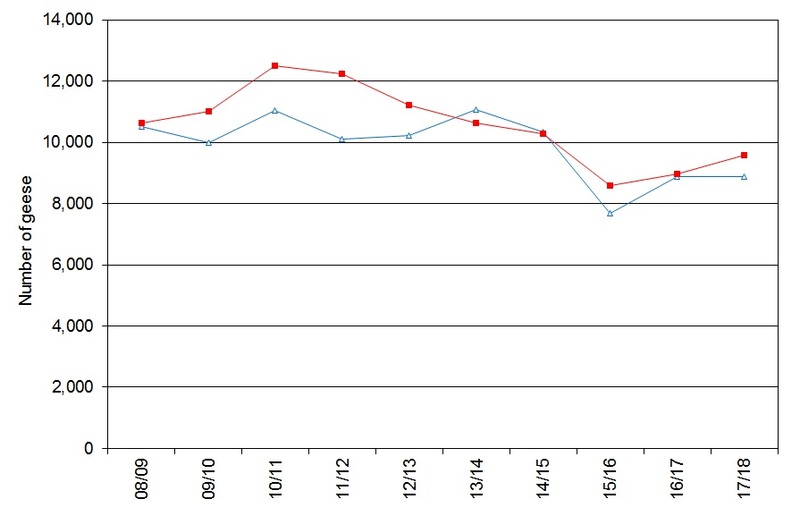 mean for 2009 is from population estimates for 2007–11) is shown as a red line. 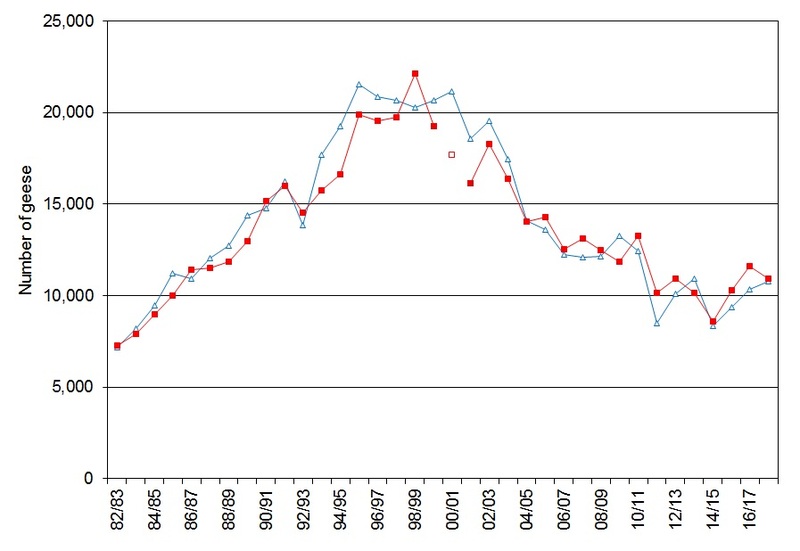 The open circles indicate estimated values for years when data were missing from Ireland. The open triangle indicates the estimated value for 2001 when data were missing due to the outbreak of Foot and Mouth disease that year. All wintering resorts in Britain (except for the Small Isles where there no longer seem to be regularly wintering geese) were covered at least once during the 2017/18 season. On Islay, due to poor weather during the spring count and large discrepancies between the two count days, counts were substituted to better reflect numbers that might have been expected. For any sites not covered during the census period, counts were substituted with those undertaken close to the defined dates: amounting 0.7% of the autumn total and 5.1% (excluding Islay) of the spring total. Overall, totals of 10,774 and 10,942 Greenland White-fronted Geese were recorded in autumn 2017 and spring 2018, respectively (Table 1). This represents an increase of 4.3% compared with autumn 2016 and a decrease of 5.6% compared with spring 2017 (Figure 2). During the autumn census, 5,351 birds were recorded on Islay, with 5,374 birds seen elsewhere in Scotland, 40 birds reported in Wales and none recorded in England. During the spring census, 5,593 were recorded in Scotland (excluding Islay), 4 in Wales and 6 in England. On Islay, a total of 4,442 was recorded; however, a substituted total of 5,319 geese (taking the maximum counts from each sector over the two days) was used in the population total. Figure 2. Coordinated count totals of Greenland White-fronted Geese in Britain, 1982/83–2017/18, showing autumn (open triangles) and spring (filled squares) census results for each season. Note the missing value for spring 2001 (unfilled square) due to the outbreak of Foot and Mouth Disease that year (from Fox et al. 2018). Good census coverage in Ireland was achieved, with most of the known flocks counted at least once over the course of the winter. During the autumn census, counts for eight sites were substituted, amounting to 3.0% of the Irish total, whilst counts for thirteen sites were substituted for the spring census, representing 9.6% of the total. Overall, totals of 8,884 and 9,587 Greenland Whitefronts were recorded in autumn 2017 and spring 2017, respectively (Table 1). This represents a slight decrease (0.4%) compared to the autumn 2016 census and a 7.0% increase on the spring 2017 census (Figure 3). . During both censuses, the majority of geese were recorded at Wexford, with 7,030 seen there during autumn (0.8% higher than in 2016) and 7,637 in spring (8.4% higher than in 2017). Figure 3. 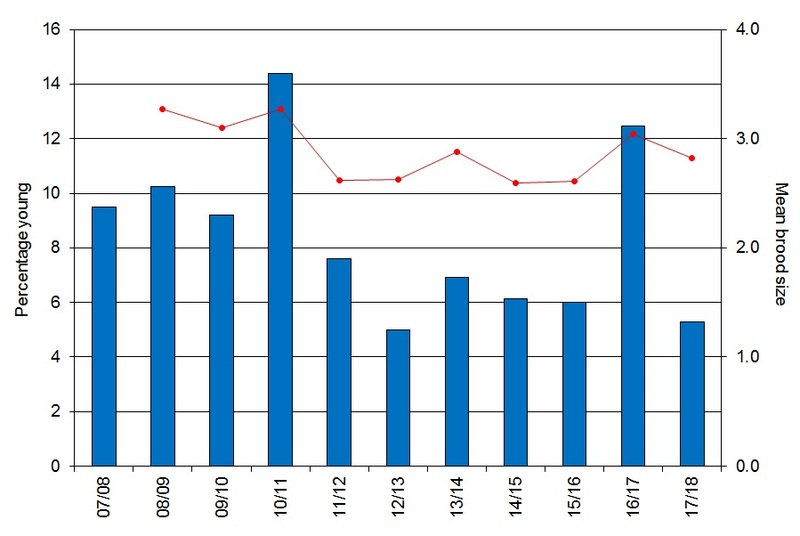 Coordinated count totals of Greenland White-fronted Geese in Ireland, 2008/09–2017/18, showing autumn (open triangles) and spring (filled squares) census results for each season (from Fox et al. 2018). Table 1. Autumn and spring counts in Britain and Ireland, 2017/18 (includes substituted counts; see full report) (From Fox et al. 2018). A total of 4,724 Greenland White-fronted Geese was aged at 26 sites across Britain during 2017/18, of which 10.7% were young birds (Table 2); lower than in 2016/17 (16.5%) and below the previous ten-year mean (13.2%, 2007/08 – 2016/17) (Figure 4). Overall, mean brood size was 2.63 young per successful pair (148 families assessed, at 12 sites) which was slightly lower than the previous season (2.78) and also the previous ten-year mean (2.95, 20017/08 – 2016/17) (Table 2 & Figure 4). Across the British sites, the percentage of young ranged from 0% to 55.6% (with sample sizes ranging from two to 1,970 birds), with 18 sites exceeding 10% young in flocks (See Fox et al 2018 for details). On Islay (where the highest number of birds were aged), the percentage of young was 9.3% (compared with 18.4% in 2016/17), whilst elsewhere in Britain, 11.6% of the birds aged (2,754) were young (compared with 15.3%) in 2016/17) (Table 2). Figure 4. The percentage of young (blue columns) and mean brood size (red circles) of Greenland White-fronted Geese in Britain, 1993/94–2017/18 (from Fox et al. 2018). In Ireland, 5,202 birds were aged at eight sites, resulting in an overall percentage young of 5.3%, lower than the previous five-year mean (7.3%, 2012/13-2016/17) (Table 2 & Figure 5). Overall, mean brood size was 2.82 young per successful pair (of 77 families assessed at four sites), which is lower than in 2016/17 (3.04) but slightly higher than the previous five-year mean (2.75, 2012/13-2016/17) (Table 2 & Figure 5). The percentage young varied between sites ranging from 0% to 15.8% (with samples sizes ranging from 19 to 4,859 birds), with one site exceeding 10% young amongst flocks (see Fox et al. 2018 for details). 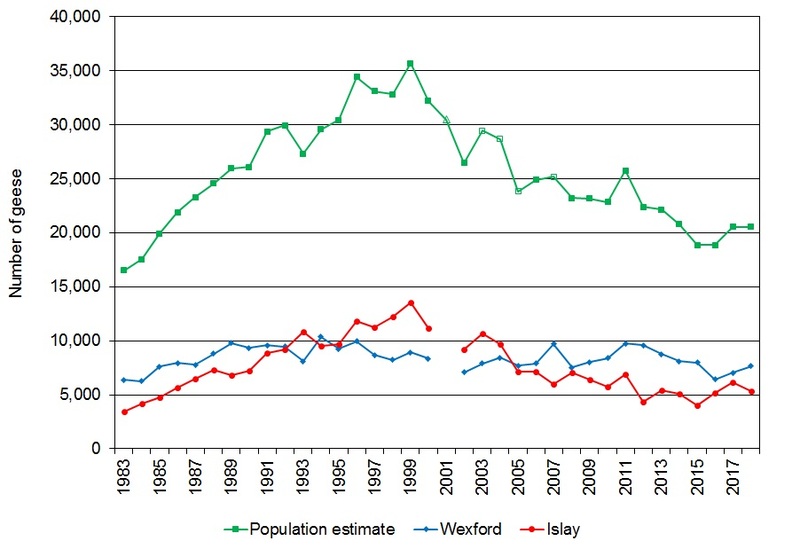 The majority of birds were aged at Wexford, of which 5.3% were young birds (Table 2). Figure 5. The percentage of young (blue columns) and mean brood size (red circles) of Greenland White-fronted Geese in Ireland, 2007/08 – 2017/18 (no overall brood size data are available for 2007/08) (from Fox et al. 2018). Table 2. Percentage of young and mean brood size of Greenland White-fronted Geese in Britain and Ireland during winter 2017/18 (from Fox et al. 2018). Since the mid-1990s, this small global population of Greenland White-fronted Geese has shown consistent decline. Despite what appeared to be some level of stability between 2008 and 2013, there have since been further declines, with the 2016 population estimate being 47.1% lower than the peak in 1999 (35,692). Although the number of individuals counted during spring 2018 was down very slightly on the previous year (20,556 in spring 2017), it was encouraging to see the population remain above 20,000 in 2018 (Figure 6). 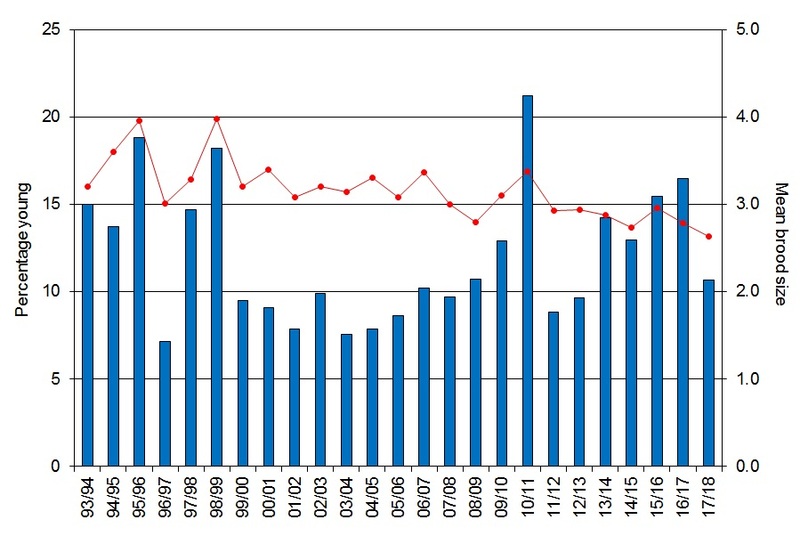 The recent increase in population size is likely due to the good breeding season in 2016, which was particularly noticeable amongst flocks in Ireland where the percentage of young rose above 10% for the first time since 2010/11. However, 2017 appeared to be another poor breeding season for this species, particularly in Ireland, which may, in part, by why numbers have not increased. Previous annual results will be archived here. Annual Greenland White-fronted Goose Study reports can be found on the Reports & newsletter page. Fox, A.D. 2003. The Greenland White-fronted Goose Anser albifrons flavirostris. The annual cycle of a migratory herbivore on the European continental fringe. Doctor’s dissertation (Dsc). National Environmental Research Institute, Denmark. Fox, A.D., D.W. Norriss, D.A. Stroud & H.J. Wilson. 1994. Greenland White-fronted Geese in Ireland and Britain 1982/83-1993/94 – the first twelve years of international conservation monitoring. Greenland White-fronted Goose Study Research Report No. 8. Hunting in Iceland: The numbers of Greenland White-fronted Geese hunted in Iceland are available here.